Treating patients with COPD effectively can be a challenge. With their ability to literally take a breath acutely impaired, how can we help them get the right dose of inhaled bronchodilators? What kinds of devices might work better? Patients with severe COPD often don’t get the right dose of prescribed medications when they use pMDIs or DPIs. We also know their I:E ratios affect delivered doses from nebulizers, but what isn’t well documented is the impact of inspiratory flow. Given that a wide range of peak inspiratory flows is defined as suboptimal for DPI, we tested the consistency of dosing from a mesh nebulizer over a range of breathing patterns representing COPD patients with suboptimal peak inspiratory flow. Six (6) breathing patterns were observed; five (5) covered a range of patients with severe COPD. The sixth was the test pattern specified in the European Committee for Standardization (CEN) EN 13544-1 nebulizer testing guideline, which was used for comparison of the results to standard test results. A Philips InnoSpire Go mesh nebulizer for this study. Results were presented at this year’s Respiratory Drug Delivery conference in Tucson. We found that the dose delivered by the mesh nebulizer was reliably independent of peak inspiratory flows over the range of 10–65 L/min. This is in marked contrast to the relationship between flow and dose delivery for many DPI devices. This may have implications when considering treatment, especially for those with severe COPD who may struggle to achieve moderate to high inspiratory flows. The results for the CEN pattern provide a reference to standard nebulizer test methods and support the fact that delivered dose from constant output nebulizers is dependent upon the I:E ratio of the breathing pattern. 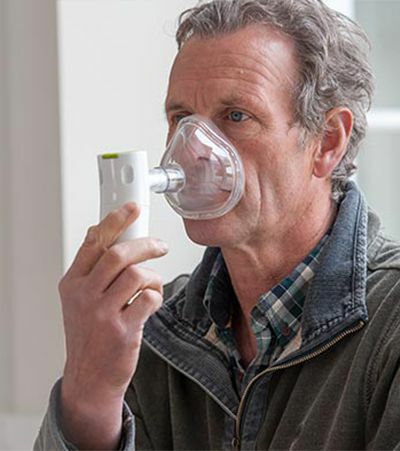 The dose delivered by the mesh nebulizer was relatively unaffected by peak inhalation flow when tested using simulated breathing patterns with an I:E ratio representative of patients with severe COPD. What might this mean for your patients? Prescribing a mesh nebulizer for certain acute COPD patients may help to ensure that they receive the dose of medication that has been deemed best for their condition. Respironics Respiratory Drug Delivery (UK) Ltd., a business of Philips Electronics UK Limited.